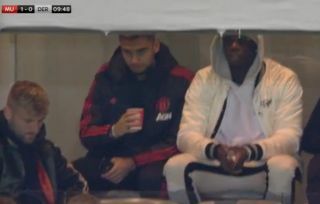 Manchester United midfielder Paul Pogba has been spotted watching tonight’s clash against Derby County in the League Cup following reports of his falling out with Jose Mourinho. The Times claimed today that the France international will no longer captain the side after Mourinho became unimpressed by his attitude. Pogba has been given the armband on a few occasions this season, but it seems he’s angered Mourinho by questioning the team’s playing style publicly.